are based in Baton Rouge, But we service a 60 mile radius in the surrounding area. We will be glad to quote you a price on moving your manufactured home anywhere in the state of Louisiana. 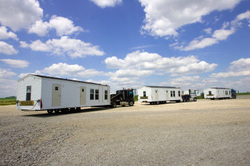 At Baton Rouge Mobile Home Movers we work with mobile home dealers and Manufactured home factories, and individual homeowners. We strive to give our customer the best home-transporting experience. Call us today at 225-228-4422 for a fast and free quote.